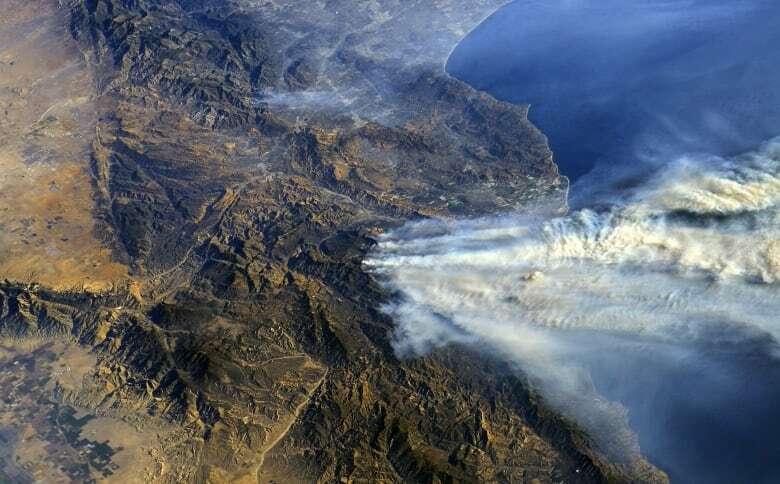 Fanned by gusting winds, wildfires raged in densely populated Southern California for a fourth day on Thursday, with a new blaze north of San Diego exploding in size in just a few hours and dangerous conditions forecast until Sunday. The blazes destroyed hundreds of houses and forced many Los Angeles-area schools to close. Flames hopscotched over highways and railroad tracks, and residents rushed to evacuate their homes with only minutes' warning, some leaving behind holiday gifts. People feared for the safety of animals from cats to llamas. About 200,000 residents were evacuated from their homes at one point, though some were due to return on Thursday evening. whipped up by the region's notorious westward Santa Ana winds that could reach hurricane strength. The winds blow in hot and dry from the California desert, and the state CAL FIRE agency said gusty winds and extremely low humidity would continue through Sunday. "Prepare now to ensure if evacuated you and your family are ready to GO!" CAL FIRE said on Twitter. The Thomas Fire northwest of Los Angeles grew to 46,540 hectares from 38,850 hectares and destroyed 439 structures, officials said. More than 2,600 firefighters from as far away as Portland, Oregon, and Nevada were battling the blaze, which was five per cent contained. North of San Diego, another blaze called the Lilac Fire grew from a small blaze to 1,011 hectares in just a few hours on Thursday, CAL FIRE said, prompting Gov. Jerry Brown to declare a state of emergency for San Diego County. The blaze destroyed 20 structures and prompted evacuations and road closures. Propane tanks under several houses exploded from the heat, sounding like bombs, according to a Reuters photographer at the scene. The other fires, which broke out on Monday and Tuesday, have reached into the wealthy enclave of Bel-Air on Los Angeles' West Side. Some major highways in the densely populated area were intermittently closed. Firefighters and helicopters sprayed and dumped bucketloads of water to try to contain the flames against a hellish backdrop of flaming mountains and walls of smoke. No civilian casualties or fatalities have been reported from the blazes but three firefighters were injured, the Los Angeles Fire Department said. In the seaside enclave of Faria Beach, caught between burning mountains and the Pacific Ocean, northwest of Ventura, fires spread down the smoking hills. 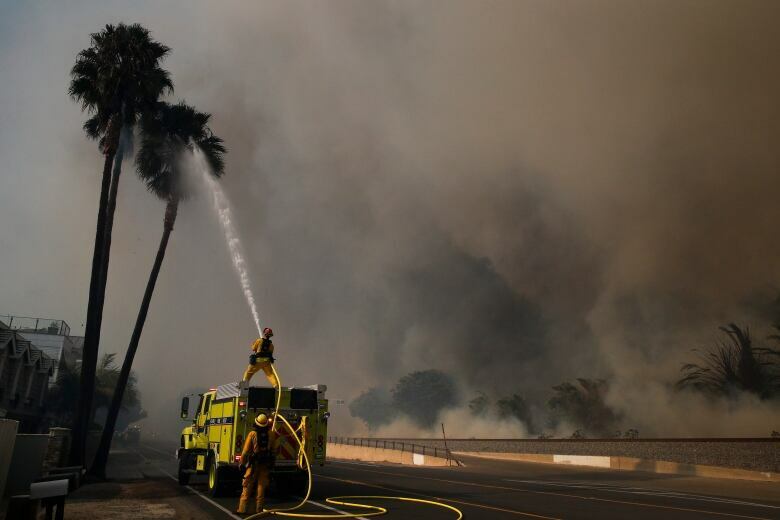 Flames jumped the heavily used U.S. 101 highway and headed toward clusters of beach houses. Firefighters lined up along a railroad track, the last barrier from the flames. Surrounded by strong winds and smoke, resident Songsri Kesonchampa aimed a garden hose at a large pine tree between her Faria Beach house and the fire, attempting to fend off disaster. 'If this tree catches fire, the strong wind will blow the flames towards my house. I need to protect this tree," she said. "In the 10 years I've lived here, I have never seen anything like this," she added. As she spoke, a sheriff's car drove by, ordering residents to evacuate. "The fire is here. You must evacuate your homes right now," an officer said over the loudspeaker. In the coastal city of Ventura, resident Maurice Shimabuku said his friends had told him to evacuate but he was staying put for now, feeling safe because he was near the Pacific Ocean. "I know I can just run back out that way, so I am relatively safe," he said. "I even have a surfboard and a wetsuit in my backyard right now, if I need to paddle away." Heavy smoke made breathing hazardous in some areas, and residents were urged to stay inside. Ventura County authorities said air pollution measures in the Ojai Valley were "off the charts." The Los Angeles Police Department tweeted, "LAPD Working to Save Every Californian, Pets Included" along with a photo of a police officer in a respirator rescuing a cat. The Los Angeles County animal shelter said it was hosting 184 pets including llamas, donkeys and horses while reports said 29 horses were burned to death on Tuesday at a ranch in the Sylmar neighbourhood of Los Angeles. The Skirball Fire in Los Angeles has forced hundreds of residents in the wooded hills near the Bel-Air neighborhood to evacuate and charred more than 192 hectares. Jeremy Broekman was camped out at his in-laws' house in Sherman Oaks after evacuating his family of five early on Wednesday from their home 1.6 km away from the Skirball fire. Broekman, who runs a public relations firm from his home office, had just an hour to get his family out of the house, grabbing hard drives and Pokemon cards and leaving behind a pile of Hannukah presents. He spent Thursday trying to work and checking the news while also caring for his three children, whose schools were closed because of the fire. "Although we always say we can work remotely with the use of a laptop, when you are displaced like this you are emotionally unbalanced," he said. Skirball threatened media magnate Rupert Murdoch's Moraga Estate winery. The property was evacuated, with possible damage to some buildings, Murdoch said in a statement, but "We believe the winery and house are still intact." The Los Angeles Unified School District, the country's second largest with more than 640,000 students, said it closed at least 265 of its nearly 1,100 schools. The University of California Santa Barbara cancelled classes as well. Utilities cut power to customers in some mountain communities northeast of San Diego and east of Los Angeles to lessen fire danger. The outage could last several days. The fires are the second outbreak to ravage parts of California this autumn. 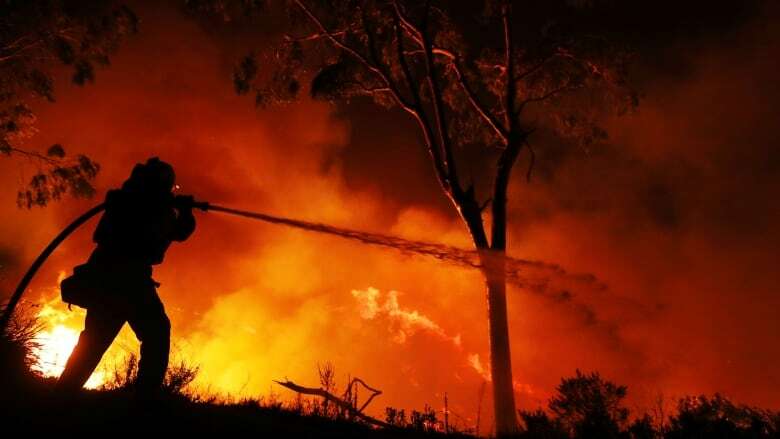 The celebrated wine country in the northern part of the state was hit by wind-driven wildfires in October that killed at least 43 people, forced some 10,000 to flee their homes and consumed at least 9,900 hectares north of the San Francisco Bay area. The California Department of Insurance said the northern California blazes caused insured losses of more than $9 billion US.